The DrSCADA general purpose RTUs can be built and configured in different ways, depending upon the requirements. Our sucker rod pump controller supports user logic and AGA gas calculations, and can be used as general purpose programmable RTU by disabling pump control. User Programmable Logic, or UPL, is a text based language, with the ability to drive the analog and digital I/O, perform mathematical calculations, move data around in Modbus registers, and configure Modbus messages to read data from and write data to other Modbus devices. The loader/debugger for UPL allows the user to load UPL to a local or remote RTU, to save and restore loaded logic and / or the Modbus database, to set the time, and to observe the Modbus database and local variables while the RTU is in operation. UPL is a key component in our flow computer for liquid petroleum pipelines. UPL is used to configure messages for slave devices such as coriolis meters, viscometers, and power meters. RTUs can be built as controllers without any local user interface, or they can be built with a local keypad and display. Our typical display is backlit, and supports either 16 lines of 30 columns of text data, or 240 x 128 pixels. 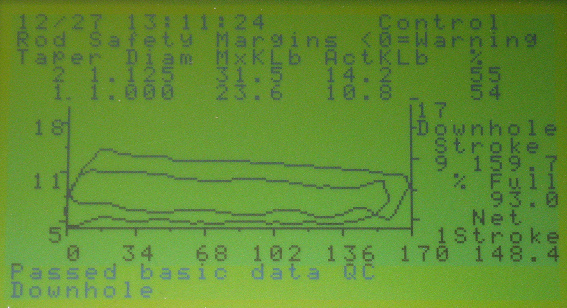 This standard display is used in our flow computers, for example. Here is a recent photo of the usual display with mixed text and graphics, showing a surface and downhole card for a sucker rod pump controller.